Admission Matters offers comprehensive, expert, and practical advice for parents and students to guide them through the college admissions process. From building a college list, to understanding standardized tests, to obtaining financial aid, to crafting personal statements, to making a final decision, this book guides you every step of the way with clear, sensible advice and practical tips. 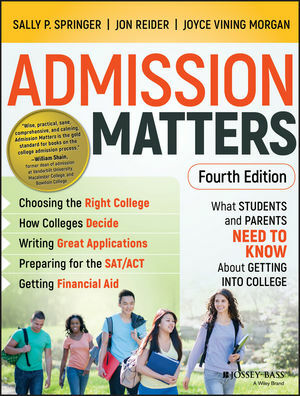 This new fourth edition has been completely updated to reflect the latest changes in college admissions. including new developments in standardized testing, applications, financial aid and more. Questionnaires, interactive forms, checklists, and other tools help you stay focused and organized throughout the process.. With the answers you need and a down-to-earth perspective, this book provides an invaluable resource for stressed-out students and parents everywhere. Applying to college can be competitive and complex. Admission Matters offers real-world expert advice for all students, whether you're aiming an Ivy or the state school close to home. It also includes much needed guidance for students with special circumstances, including students with disabilities, international students, and transfer students. In addition, athletes, artists and performers, and homeschoolers will find valuable guidance as they plan for and apply to college. Whether you think you've got applying to college under control or don't even know where to begin, Admission Matters is your expert guide throughout the college admissions process. Sally P. Springer, PhD, is associate chancellor emerita at the University of California, Davis, and a psychologist with more than 30 years of experience in higher education as a professor and administrator. She has taken the college admissions journey twice with her children. Jon Reider, PhD, is director of college counseling at San Francisco University High School, an independent 912 high school. For 15 years he served as an admissions officer and taught humanities at Stanford University. Joyce Vining Morgan, PhD, is a certified educational planner specializing in college admissions with an online individualized practice. She has over 20 years of experience in college admissions counseling.